Over the last 30 years, scientific and technological progress has boosted the development of medical devices that can assist patients and support medical staff. With regard to the rehabilitation of patients who have suffered from traumas, robotic systems can be an aid for rapid patient recovery. This paper focuses on studying and implementing a system for measuring the finger position of one hand with the aim of giving feedback to the rehabilitation system. It consists of a glove where sensors are mounted suitably configured and connected to an electronic conditioning and acquisition unit. The information regarding the position is then sent to a remote system. 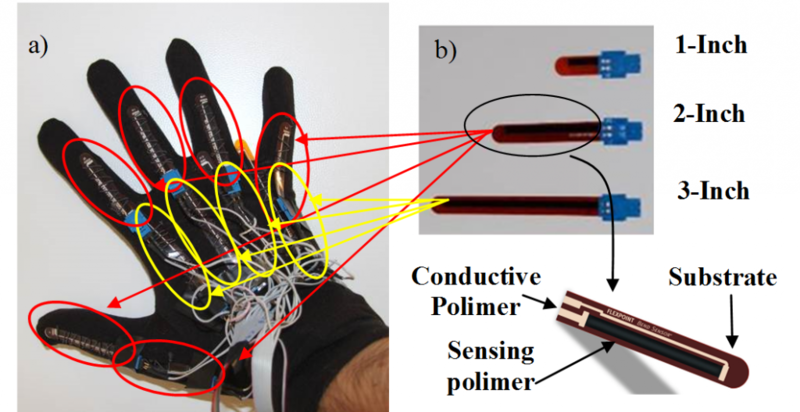 The objective of this paper is to provide a sensorized glove for monitoring the rehabilitation activities of the hand. The glove can have several other applications such as: 1) the recognition of sign language; 2) the diagnostic measurement of the finger movement at a distance; and 3) the interaction with virtual reality.